Sahana Vyas, M.D., is from Louisville, Kentucky. She attended Harvard University, where she received a B.A. degree in Romance Languages and Literature. 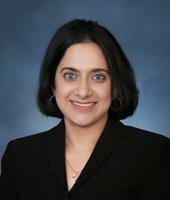 Dr. Vyas earned her medical degree at Saba University School of Medicine, followed by an internship in General Surgery at Brown University - Rhode Island Hospital. She completed her ophthalmology residency at The University of Louisville, where she also served as Chief Resident in her final year. Dr. Vyas finished a Retina-Vitreous Fellowship in Vitreoretinal Surgery at The University of Virginia. Dr. Vyas is certified by the American Board of Ophthalmology. She is a member of the American Academy of Ophthalmology and American Society of Retina Specialists.